The following article by Rabbi Dr Raymond Apple appeared in The Jewish Bible Quarterly, Vol. 44, no. 4, October-December 2016. Psalm 145, colloquially known as Ashrei, is one of the best known biblical passages in the Jewish liturgy. It occurs three times in the daily prayers, more often than any other psalm. It appears first in the early morning p’sukei d’zimra (Passages of Praise); next in the final section of the morning service; and also at the beginning of the afternoon service. This threefold usage fulfils the principle found in TB B’rachot 4b that whoever recites this psalm three times a day is assured of a place in the afterlife. The triple recitation exemplifies a tendency in Jewish liturgy whereby important phrases and quotations are said more than once, with a preference for three times. TB B’rachot 4b notes that Psalm 145 has two special features to commend it. 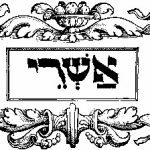 The first is that, being constructed as an alphabetical acrostic (with the exception of the letter nun), it enlists the whole of the alef-bet to extol the deeds of the Almighty. It should be added, however, that there are several other psalms with alphabetical acrostics. The second is that it articulates the tenet of God’s generosity and providence: “You give it openhandedly, feeding every creature to its heart’s content” (verse 16; cf. Ps. 104:28, JPSA translation). The Talmud does not call the psalm by its current title of Ashrei, but by its opening words, T’hillah l’David, A song of praise; of (or by, or in the style of) David, arising out of which the name T’hillim (Praises) is applied to the whole psalter. A further version of the word t’hillah comes in the final verse (verse 21), which refers to “the praise [t’hillat] of the Lord”. The popular appellation of Ashrei, which is generally attached to the psalm, comes from the two extra verses (Psalm 84:5 and 144:15), each one commencing with the word Ashrei, which form a prologue to the psalm in its prayer-book version. The present paper examines the possible reasons for the introduction of this prologue, and then proceeds to analyse a second addendum, the Va’anachnu verse which is appended to the psalm as an epilogue (Psalm 115:18). The question is why an Ashrei prologue was necessary at all, and if so, why the choice of Psalms 84:5 and 144:15? A number of verses in Psalms commence with the same word, including Psalms 84:6, which appears directly after one of the verses used. In fact, some communities did use other verses. The Roman rite used Ashrei temimei derech, “Happy are those whose way is blameless” (Psalm 119:1). Baer notes from two (unidentified) manuscript siddurim a custom of saying this latter verse prior to our present Ashrei. Machzor Vitry had four extra verses. In the end, the best argument in favor of Psalm 144:15 is rather prosaic. It is the final verse of the psalm immediately preceding Psalm 145. Hence anyone who knew Psalms by heart would automatically link the final verse of Psalm 144 with the commencement of the next psalm. Why then was Psalms 84:5 brought in from elsewhere in the psalter and placed ahead of Psalms 144:15? Explanations for the Ashrei prologue can be termed the literary, the communal, and the liturgical approaches. They are not necessarily mutually exclusive, but the third is the most significant. The literary approach sees the first Ashrei verse as reflecting the poetics of Psalm 145. It focuses on key parallels between the language of the prologue and psalm, especially the root h-l-l, to praise, central to both and appearing in the title T’hillah l’David, and words for eternity (e.g. od, l’olam va’ed and b’chol yom). This approach may also justify the epilogue, which, like Psalms 84:5, has a key verbal parallel with the psalm. This parallel is the root b-r-ch, to bless, which is a highlight of both the psalm and the epilogue. However, these are clearly later rationalisations once the prologue and addendum verses were attached to Psalm 145. This approach does not demonstrate a need to add verses in the first place; the psalm could have managed without the Ashrei and va-anachnu addenda. The communal approach posits that the prologue verses temper the universalism of Psalm 145 and give it a more particularly Israelite orientation. While the psalm constantly uses the word kol, all, everybody, the prologue singles out the group (am), who dwell and worship in the sanctuary (“Your house”). This idea is also found in Psalm 33:12, “Happy (ashrei) the nation (goy) whose God is the Lord, the people (am) He has chosen to be His own”. “Your house” is presumably the Temple; the Midrash understands it as the synagogue and house of study, also specifically Israelite institutions. A parallel is found in the epilogue, Psalm 115:18. While Psalm 145 commences in the first person (aromim’cha, “I will extol You”), where “I” can mean any human being, not necessarily an Israelite, the epilogue commences va-anachnu (“But we shall bless the Lord”), again denoting the people of Israel (“we”). The liturgical approach considers that the prologue must be seen as part of liturgical history and theology. The key question from this point of view is what is the function of Psalm 145 in the prayer service and how the added verses contribute to that role. Psalm 145 introduces a unit of six psalms (145-150) customarily read on weekdays (Sabbaths and festivals have extra psalms). By means of the prologue verses, this unit of psalms gains a preface which reflects on and expresses the happiness that arises out of being in God’s House. TB B’rachot 32b tells of the early pietists who meditated for an hour before the commencement of formal prayers. There, Rabbi Yehoshua ben Levi gives Psalms 84:5 as the source for the pre-worship hour of meditation, making it a suitable introduction to the unit of Psalms in the morning service. Tosafot (s.v. Kodem t’fillato) to this passage states that the prologue was instituted for this purpose, but does not identify by whom or when. The daily recital of Psalms, originally by heart, was facilitated by the use of acrostics such as the alef-bet structure of Psalm 145, making it very popular. There is also a user-friendly shin alliteration in words like Ashrei, yosh’vei, ashrei, shekachah, ashrei and she-YHVH. There is wide evidence of the cultic role of the psalms, reflecting religious poetry in other Middle Eastern cultures, so it is clear that Psalm 145 was used in Second Temple times. The Dead Sea Scrolls version gives each verse a refrain, “Blessed be God (Elohim) and blessed be His name forever and ever”, suggesting a liturgical context. Whether this means that the leader said the first half of a sentence and the congregation responded with this refrain, is not certain. In TB Shabbat 118b, Rabbi Yose says, “May my lot be with those who complete the Hallel every day”. In this context, Hallel is not the “Egyptian” Hallel, Psalms 113-118, or the “Great” Hallel, Psalm 136, but the psalter as a whole. Ideally, one would recite the entire Book of Psalms every day. While some did, others recited only the final group of six psalms. This is the view of Tractate Soferim 17:11 as well as Alfasi and Maimonides (Hil’chot T’fillah 7:12). Rashi there states that even Psalms 148 and 150 would suffice. The emphasis on the final six psalms is because they enshrine the essence of Jewish ethics and theology, leading up to the final crescendo of the whole Book of Psalms, “Let all that breathes praise the Lord. Hallelujah” (Psalm 150:6). By means of the two introductory verses to Psalm 145, the worshipper expresses happiness to have come to God’s house, even if he did not arrive early, and to be a part of the prayer chorus of the people who have it so. This prayer chorus attuned itself to the mood of prayer, and acclaimed God prior to the formal morning service commencing with the call to worship, Barechu, “Bless the Lord who is worthy of praise”. At the end of the morning prayers there is a second instance of Ashrei and Psalm 145, this time as a closing reflection on the happiness which comes from worship. There are no new features in the brief afternoon service, the contents of which are already known from the morning prayers. Introducing the service with Psalm 145 automatically requires following the now established precedent of saying the prologue verses. In explaining the afternoon service, R. Elie Munk cites an observation attributed to King David in the Yalkut Shimoni, “Never have I begun my prayer to God before having composed and prepared myself for it.” The afternoon Ashrei/Psalm 145 is thus an encapsulation of the entire P’sukei d’Zimra prefatory section of the morning service. In the prayer service, Psalm 145 is given an epilogue, “But we shall bless the Lord now and forever, Hallelujah” (Ps. 115:18). From as early as the time of Seder Rav Amram Gaon this was explained as instituted in order to provide a concluding Halleluyah for the psalm, in line with the pattern of Psalms 146-150. Additionally, the addendum broadens the psalm by saying “we” and not just “I”. There is another possible function of Psalms 115:18 here. Bearing in mind that there is no nun verse in Psalm 145, the psalm is only 21 verses long, an odd number. With a nun verse the number would have been 22. If, as could have been the case, alternate verses were read by the leader and congregation (a usage later followed in some congregations, at least on Shabbat), an extra verse was needed to even out the reading. Psalms 115:18, with a theme similar to Psalm 145:21, was added in order to provide a 22nd verse for the congregation to use as a response to the leader’s recital of verse 21. The Talmudic explanation of the prologue as deriving from the pre-worship meditation might also hold a key to the epilogue, since the early pietists would also wait and meditate for an hour after their prayers. Baer reports a medieval French custom of prefacing Psalms 115:18 with the verse which precedes it, “The dead cannot praise the Lord, nor any who go down into silence” (Ps. 115:17), giving the last verse even more emphasis. There may be a homiletical significance to the small unit of Psalms 115:17-18. While sitting in the synagogue in worship brings a person a feeling of happiness, emerging into the outside world brings challenge. It is tempting to succumb to the often questionable attractions which the day constantly brings with it; the erstwhile worshipper must have the moral courage to live according to the words of the prayers and psalms, and to turn every decision, every deed into actions which are worthy of and praise of God, now and forever. 1. TB B’rachot 4b attaches the missing nun homiletically to an unpleasant verse in Amos 5:2. The Septuagint, Vulgate, Syriac Peshitta and Dead Sea Scrolls offer (or construct) a nun verse beginning ne’eman. This addition might not be authentic and is not known in Jewish tradition. It is possible that there never was a nun verse; some other alphabetical psalms have letters missing, e.g. Psalms 25 and 34. 2. R. Apple, “The Happy Man of Psalm 1,” Jewish Bible Quarterly 40:3 (2012) pp. 179-182; cf. M. Buber, Right and Wrong: An Interpretation of Some Psalms, trans. R. G. Smith (London: SCM Press, 1952) pp. 53-62. 3. Psalms 1:1, 32:2, 33:12, 40:5, 41:2, 65:5, 84:6, 89:16, 94:12, 106:3, 119:1-2, 127:5, 137:9, 146:5. 4. S. Baer, Seder Avodat Yisra’el (Roedelheim: Schocken, 5697) pp. 68-69. 5. S. Hurwitz, ed., Machzor Vitry l’Rabbenu Simchah, 2nd ed., 1923. This usage was followed in pre-Expulsion England and medieval Germany. 6. A. Berlin, “The Rhetoric of Psalm 145,” in Biblical and Related Studies Presented to Samuel Iwry, ed. A. Kurt & S. Marschauer (Winona Lake, Ind. : Eisenbrauns, 1985) pp. 17-22. 7. Z. Adar, Sefer Tehillim (1976), p. 179, cited by Berlin, op. cit., p. 22. 8. Midrash on Psalms, ed. W. G. Braude (New Haven: Yale University Press, 1959), vol. 2, p. 65. 9. Mitpallelin here probably indicates prayer in general, not merely, as in other contexts, the Amidah. See the commentaries to Mishnah B’rachot 5:1. Later ages did not time the one hour precisely so long as one pondered God’s greatness and banished irrelevant thoughts. 10. E. HaLevi, Yesodot HaTefillah (Tel Aviv: Zioni, 5718) p. 134. 11. M. Buttenwieser, The Psalms Chronologically Treated (NY: Ktav, 1969) pp. 848-49; prolegomenon by N. M. Sarna, p. xv. 12. Psalm Scroll 11QPsa. See P. W. Flint, Dead Sea Scrolls and the Book of Psalms (Leiden: Brill, 1997); J.A.S. Sanders, The Psalms Scroll of Qumran Cave 11 (11QPsa) (Oxford, 1965). 13. I. Elbogen, Jewish Liturgy: A Comprehensive History, trans. R. Scheindlin (Philadelphia/Jerusalem: JPSA/JTSA, 1993) p. 75. 14. E. Munk, World of Prayer – vol. 1, Weekday Prayers, ed. M. Plotkin (Jerusalem/New York: Feldheim, 2007) pp. 97-98. 15. Baer, loc. cit. ; Elbogen, loc. cit. 16. For example, in “old” British congregations such as Bayswater and Hampstead. Mishnah B’rurah (note 9 to Orach Chayyim ch. 65) gives Psalm 145 T’hillah l’David as an example of a prayer said by the entire congregation aloud together.